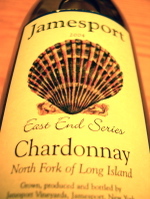 Yesterday we talked about Jamesport Vineyards' 2004 Cox Lane Chardonnay, so to continue LENNDEVOURS Chardonnay Week 2006, we'll turn our sights on it's simpler, crisper little brother -- East End Series Chardonnay. This is a crisp, decidedly refreshing and appetite-whetting white wine. Its nose presents ripe peach with wisps of vanilla, but also hints at richer, more tropical fruits like mango and pineapple. Comparable flavors follow through onto the palate and are framed by a palate-cleansing zing of acidity and accented by a minerally finish. This isn't an overly complex wine, but it serves its purpose. Not only does the wine lend itself to our local fish and shellfish, but ten-percent of the proceeds from its sale goes to the Southold Project in Aquaculture Training (SPAT), an organization that, among other things, strives teach locals how to farm their own shellfish. Winemaker Les Howard hopes "Perhaps one day the shellfish in our local waters will come back in the numbers there were 30 years ago." 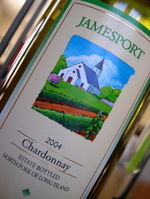 To kick off "LENNDEVOURS Chardonnay Week 2006" we've got Jamesport Vineyards 2004 Cox Lane Chardonnay ($19). 2004 was only an average growing year on the North Fork of Long Island, but Ron Goerler, Jamesport Vineyards' owner and vineyard manager, spoke highly last spring of his chardonnay (and cabernet sauvignon) grapes. He's well-regarded as a grape grower and his reputation is actually part of what attracted winemaker Les Howard to Jamesport Vineyards. When I first met Les last year, he stated a desire to make well-balanced wines first and foremost because "Spikes of oak or acidity numb your taste buds, shortening the finish." So what about this 2004 Cox Lane Chardonnay? Just over one-third of the fruit was fermented in steel tanks, while the remaining grapes were fermented in one- and two-year old oak barrels, leading to an oak-inflected, but not at all oak-dominated wine. The nose is lemony, with toasted marshmallow aromas. The winery's website describes this wine as "more like California" but I found it much more Burgundy than Napa. When chilled, it was lean, with citrus and crisp pear flavors that develop into richer baked apple and caramel as the wine warms a bit. It's medium bodied and exhibits a nice balance of fruit, oak accent and acidity. The Tasting Room, a two-location co-op tasting room that was the exclusive location for Comtesse Thérèse, Schneider Vineyards and Broadfields Wine Cellars wines will close its doors for the final time this Thursday, March 2. As I reported back in November, Leucadia National (owner's of Pine Ridge Winery in Napa) purchased the two tasting rooms along with two local vineyards. I'm a little surprised that they are closing them down already, but one winery that used to pour there, Sherwood House Vineyards, has opened its own tasting room, and I suspect that others were heading that direction. As soon as I hear back from the respective owners, I'll make sure to let you know where you can taste and buy these wines -- both in the short and long term. Between now and then, however, they are offering a great 20% off of all wine purchases. Despite ABC (Anything But Chardonnay) groups and the woody/buttery/sweet renditions many CA producers punish our palates with, chardonnay remains the king of white wine in terms of sales and acreage here on Long Island. I think name recognition at least partially drives this. The average wine drinker just doesn't know what gewurtztraminer tastes like and probably thinks of riesling as super-sweet and "not classy." The charddonnay shift is on, however, so even chardonnay haters can find bottles with nice acid, crisp fruit and none (or little) if the 2x4 flavors of old. All I know is that I have a ton of local chardonnay in my tasting queue...so to work my way through them, I'm announcing this week as LENNDEVOURS Chardonnay Week 2006. Every day I'll post reviews of at least one or two local bottlings. It might be one of my least favorite varieties, but there are some local versions I enjoy. I bet you can guess what style they're made in. Are You a Farmers Market Friend? 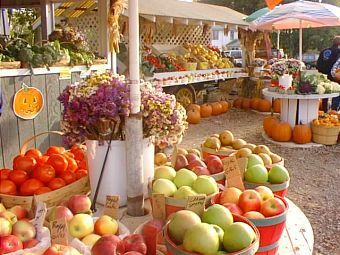 Those of us near the North Fork of Long Island are lucky to have access to some great farmer's markets and farm stands. But, not everyone is so lucky. It's possible that that is all going to change...obviously for the better. Adam Mahler's of Untangled Vine reports on a move among some Representatives in Washington D.C. to help the farmer's market movement. He has set up an interview with the Representative that introduced the bill, so keep an eye out on his blog for more information. When I first read about the proposal, part of me was worried about the potential for farmer's market homogenization. I mean, if the markets are run by some large entity, and the offerings are the same, what's the point? You might as well go to your local grocery store. But, in reading further, the legislation proposes that at least 50% of the wares come from local producers, which is good. After all, the joy of these markets is getting to know the guy up the road who grows the best tomatoes and getting the best of what your region does well. Again, if you want non-local fruits, just go to your local megamart. It's a measure worth keeping an eye on. ...like Ms. Chardonnay (seen at right). AppellationAmerica, has put together an encyclopedia of grape varieties that as entertaining as it is educational. You'll find all of the usual suspects (merlot, cabernet sauvignon etc.) but also some varieties you may not have heard of, such as michurinetz, cascade and doreen. Check it out, but beware -- you may find yourself spending a long time reading each and every one. 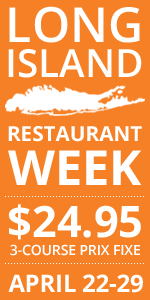 Have you stayed at a Long Island Bed and Breakfast? 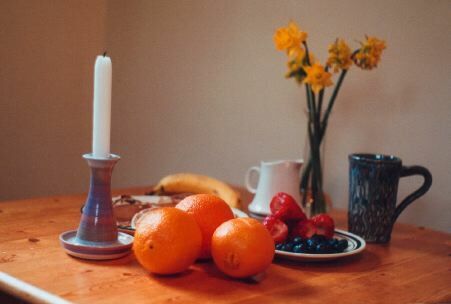 I'm working on a story for Edible East End that highlights the some of the best East End B&B breakfasts, and with so many to choose from with so many great cooks/chefs, it's a daunting task to say the least. So, if you've stayed at a local B&B and had a great breakfast that I just can't miss, let me know. On Saturday, March 11 I'll be heading to The Lenz Winery for a sure-to-be-interesting blind tasting event hosted by owner Peter Carroll and winemaker Eric Fry. 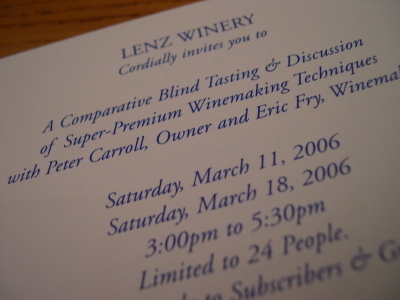 We will be tasting four Lenz wines blind against premium wines from France. I'm looking forward to the event, which (unfortunately for many of you) is invite only to members of their wine club and the press. I've always enjoyed most of the Lenz lineup, but more more excited about the opportunity to taste some of the higher-end Bordeaux in the flights. Need Help Finding a New York City Wine Shop? Dr. Vino has put together a great tool for anyone who needs to find a wine ship in Manhattan. 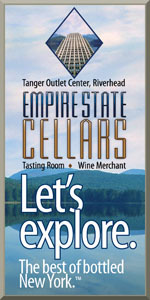 Check out his New York City Wine Shop Map, which is even available for your mobile device. With as many wine shops as there are in NYC, this is quite an undertaking, so if you know of a great shop that isn't listed, I'm sure he'd love to hear about it. Many wine "experts" turn there nose up at any wine made with hybrid grapes, deeming them "simplistic" or "without character." Wine geeks like myself, however, can recognize that such wines have their place. I've had several wines made from seyval blanc that have been clean, refreshing and delicious on a hot summer day. Vidal blanc is another hybrid that leads to some excellent ice wines in Canada and the Finger Lakes Region of New York. 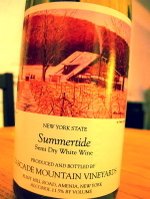 Well, this non-vintage white blend from Cascade Mountain Winery, located in Amenia, New York (Hudson Valley), is made using both seyval blanc and vindal blanc. Strawberry wine. It's not something I drink regularly and probably not anything I'd drink with non-dessert food. But, over the weekend I tasted and compared two different versions from two well-known Hudson Valley wineries, Baldwin Vineyards and Alison Wines & Vineyards. I'm not going to go into full tasting note mode here...they both look, smell and taste like strawberries, there's not a whole lot of nuance here. But there are differences certainly. Both were very sweet and edging on the cloying side of things but not quite. 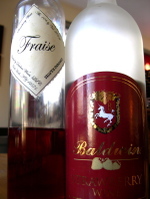 The one from Alison, named Fraise ($18 for 375ml), is the more refined of the two, less raw and more subtle. I think it would shine best with dark chocolate or chocolate cake. The Baldwin version ($13 for 750ml), on the other hand, is almost rustic in its intense strawberry character with a bit more sweetness. I'd consider drizzling this one over vanilla bean ice cream or pound cake. They both had a somewhat musty finish that was a little off putting. Because they both had it, I can only assume that is something that happens any time you make wine from strawberries. If anyone else has any experience with Strawberry wines, let me know if you've noticed the same. Valentine's Day is treated a little bit differently in our house, I think. We don't really buy each other gifts beyond a well-thought-out card. But, we have a few food traditions related to the most Hallmark of all holidays. First, we never, ever go out to dinner for the occasion. So many restaurants have over-priced, under-delivering fixed menus, and tables filled with people who never go out to nice restaurants and act like it. Second, in recent years, Nena has started making her should-be-famous banana-chocolate chip pancakes (in heart shape) on the day itself. It's a casual, fun meal that we both love...even if wine pairing is nearly impossible (sweeter bubbly like a Moscato d'Asti?). Third, I take a day off of work to shop for and cook an involved meal, with wine pairing, for the love of my life. Friday was the day for the 2006 edition of the meal. This year, I don't need to post any recipes from the meal...because I borrowed (with slight modifications) the first two courses from the king of Internet recipes (to me anyway) Stephen of Stephencooks.com. To start, I made my own version of his Salad of Pears, Roasted Beets and Three Aphrodisiacs . I replaced the fresh goat cheese with an aged one that I grated over the salad, in lieu of the lime/ginger/shallot dressing, I used blueberry vinaigrette, and I put it all over a small pile of baby romaine. The results were spectacular. 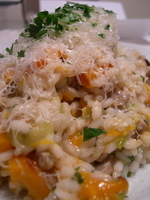 For the main course, I made my own take on Stephen's Butternut Squash Risotto with Sausage, Pancetta and Leeks. The main change I made in this one was to remove the Italian sausage and replace it with some apple-chicken sausage I picked up at Whole Foods. The sweetness of the apples matched nicely with the squash, with the salty and smokey pancetta (and of course salty parmesan) providing balance. Stephen will forever be Mr. Risotto in my mind because of this dish...which was equally delicious the next day when I mixed the leftovers with one egg, formed patties, rolled them in seasoned bread crumbs and pan fried them. Last, but not least, I made an Anjou pear crumble with old fashioned rolled oats in the crumble. I don't typically bake because I'm so awful at following recipes precisely, but it was pretty simple and it turned out pretty well. Happy Valentine's Day, Nena...I love our traditions and I love you. 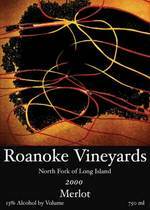 Roanoke Vineyards, one of the North Fork's newest producers has been a favorite almost from it's inception. I've written about them several times, almost always take first-time LI winery visitors there, and I named their now-sold out 2000 Merlot my favorite of 2005. Well, with a second New York Times piece this weekend, the secret is most certainly out about the two new red blends Rich and Soraya Pisacano just released. Roanoke Vineyards is a must-stop tasting room on the North Fork. From it's rich, artisanal reds, the hands-on approach of Rich and Soraya, to the opportunity to also sample wines from Wolffer Estate and Atwater Estate, it's the perfect one-stop destination...if you only have time for one stop. 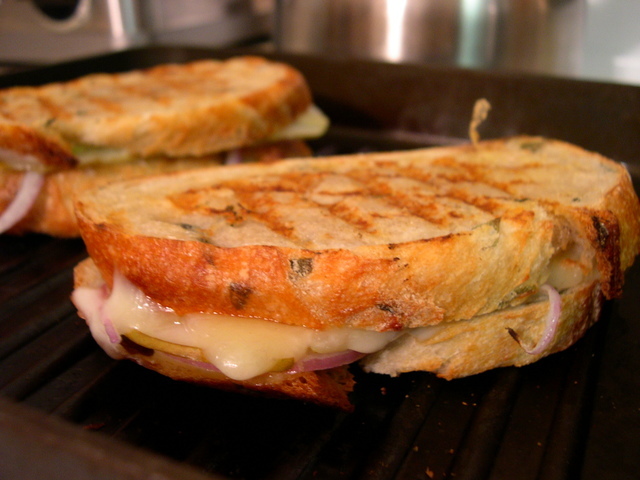 I swear, I meant to blog about Cheese Sandwich Day on the day itself, last Thursday. But, while we cooked and ate our yummy grilled cheese sandwich, a vacation day Friday and a long holiday weekend spent doing work on our new house has created a bit of a blogging back log. So what is Cheese Sandwich Day all about anyway? I'll leave that explanation up to my go-to blog when I'm looking for a delicious recipe, Stephencooks. As for our sandwiches, I stopped on the way home at the local grocery store (greatly limiting my cheese selection) and whipped up the above beauties. The ingredients are all pretty basic, run-of-the-mill items, but sometimes those are the best. I took some "fancy" bread from the in-store bakery, a scallion loaf, and topped it with thinly sliced red onion, thinly sliced ripe Anjou pear, Monterrey Jack cheese and some white cheddar. I didn't take any particular offense to the Food & Wine story that started this tidal wave of gooey cheesy goodness...but any excuse for grilled cheese is a good one, right? Think real-deal BBQ competitions don't happen outside of the south? Think again...New York City is going to be hosting its first BBQ contest on March 26 -- Grillin' on the Bay. Some of the region's best pit bosses will be cooking up chicken, pork, fish and even dessert. I know that I'm going to go if I can (never been to such an event) and if you want more information, visit White Trash BBQ's great site. And a bottle of Matthew Cellars 2001 Columbia Valley Red, compliments of the Culinary Fool and her Seattle Seahawks losing in the Super Bowl. We had a bet, and my winnings arrived yesterday. 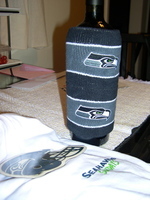 As you can see above and to the right, B tried to cover up her obvious shame by burying the bottle in Seahawks gear. She's a gracious loser, I'll give her that. I think Ben Roethlisbeagle will enjoy ripping the wrist bands to shreds. 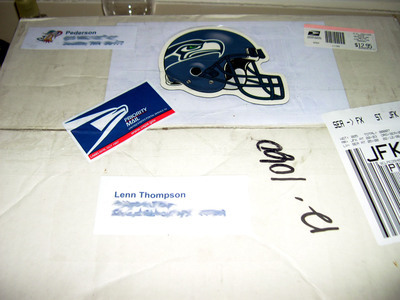 (Just teasing, I know a Seahawks fan here at the office I think he has kids. So they'll get the gear most likely). And the wrist bands are actually a nice touch for protecting the bottl as well. Nicely done, B. The bottle is now resting comfortably (sans bands) in my wine fridge for future enjoyment. I think Wesley Snipes said it best..."Always bet on black" (and gold). Go Steelers. 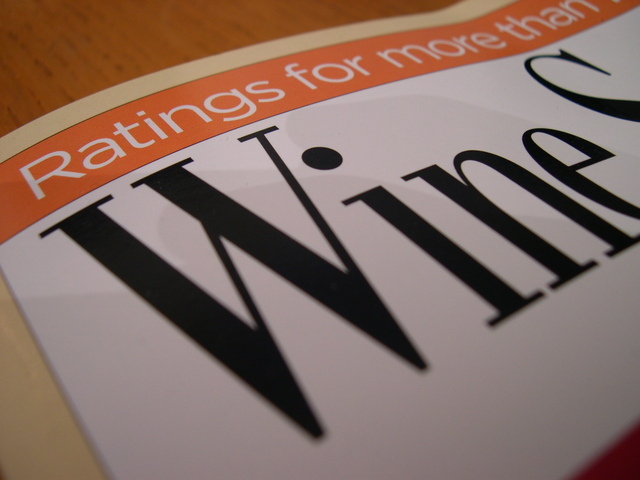 Wine lovers and writers often debate the validity and usefulness of wine scores. I think they have their place, when taken as a part of a complete review that includes tasting notes and background information. But then I finally thumbed through the February issue of Wine Spectator and came upon some disturbing scores. Now I'm the first to remind people that a wine score/rating is no more than one person's opinion. But for all four of these wines to be rated lower than anything made by Yellow Tail is simply mind-boggling. Of course it also clearly illustrates the current love affair publications like WS have with jammy, "fruit bomb" wines. Come to Long Island and taste some refined, nuanced...balanced wines. Just say no to Yellow Tail. Du you Rhone? Whether you do or not, join food and wine bloggers the world over with the latest vintage of Wine Blogging Wednesday, hosted by Jathan, founder of the newly re-designed Winexpression.com. For this, the 19th edition of WBW, Jathan has asked us to focus on the wines of the Rhone, specifically the intricate blends (unless you can find a rare varietal bottling). It looks like I'm going to have to leave my local New York wines for this one...but that's half the fun. More than half really. His annoucement provides a lot of excellent information with links to further resources. So, won't you join us on March 8? A discussion of sulfites and American vs. European winemakers seems to be underway here on LENNDEVOURS. One of my contributing columnists, Richard posted The Urban Legend of Sulfites a week or so ago and my other contributor, Charles, has chimed in with his feelings. What do you think? 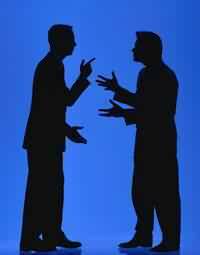 One of my favorite things about wine is the discussions (and sometimes arguments) that erupt from my love of it. Join in the fun and be heard. As if often the case, there is a lively discussion over at Vinography right now about wine reviews and whether or not we, as wine writers/critics, should use point scales or grading systems. Check it out and scroll through the comments to see my current thoughts. This is a topic I've often wrestled with...mostly because no one has been able to convince me that one way or the other is the be-all-end all. 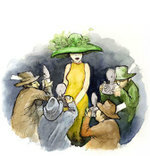 Heavy, over-manipulated chardonnay is one of the wine community’s least appealing members, at least in the eyes, and palate, of this wine lover. Wine geeks often label these wines “flabby” but I compare drinking them to sucking on a butter-slathered two by four. And, despite what some sales-minded winemakers will tell you, pairing these wines with food is a crapshoot at best. Of course, chardonnay is a key chameleon variety, with a seemingly endless array of styles. On one end you have crisp, fruity, acidic chardonnay — those that don’t spend any time in oak barrels during or after the fermentation process. These wines tend to be lighter yellow color and their flavors lean toward green apples and tart citrus with a crisp, clean mouthfeel. On the opposite end of the style spectrum are chardonnays that look like liquid gold. These wines have been born and raised in oak barrels and have gone through a process called malolactic fermentation — the conversion of malic acid to lactic acid — which gives the wine a fuller, more viscous feel in the mouth. The flavor profile in these wines is also richer, with more baked apple, butterscotch, buttery toast, vanilla and even popcorn. 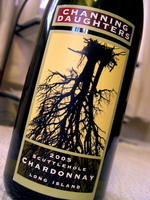 Crisp, clean and refreshing, this is a wine for those of you who think you hate chardonnay. Fermented 100% in steel tanks, you won't find any overbearing, heavy-handed oak influence. No...what you get is ripe apple and pear, fresh citrus and hints of minerals on the finish. This is what chardonnay actually tastes like — and it's delicious. ...it looks like I'll be invading San Francisco in late June for part of Usability Week 2006. Assuming my day job doesn't cut the training budget, they are sending their content manager (that's me) out your way for a few days. And, I've graciously volunteered to stay an extra couple of days if it saves the company on my flights. I probably won't know the details of my stay until April, but I hope to "bump into" as many of you as I can. Now I just need to figure out the best way to pack up a bunch of local wines to force down your throats. T Well, by my count 34 of you took part in Wine Blogging Wednesday #18 Wine Shops That Feel the Love, hosted by Dr. Vino. This was a great theme idea and I'm glad we had such a great turn out. The good doctor has posted the round-up, so let's all take a look, feel the love and thank him for hosting this time 'round. I've hit a slight snag for March's edition of the event (the blogger scheduled to host has gone missing it seems) but I think I have a backup plan that will work just fine. Stay tuned for the annoucement this week. I love riesling...particularly those from the Mosel (in Germany) and those from the Finger Lakes. 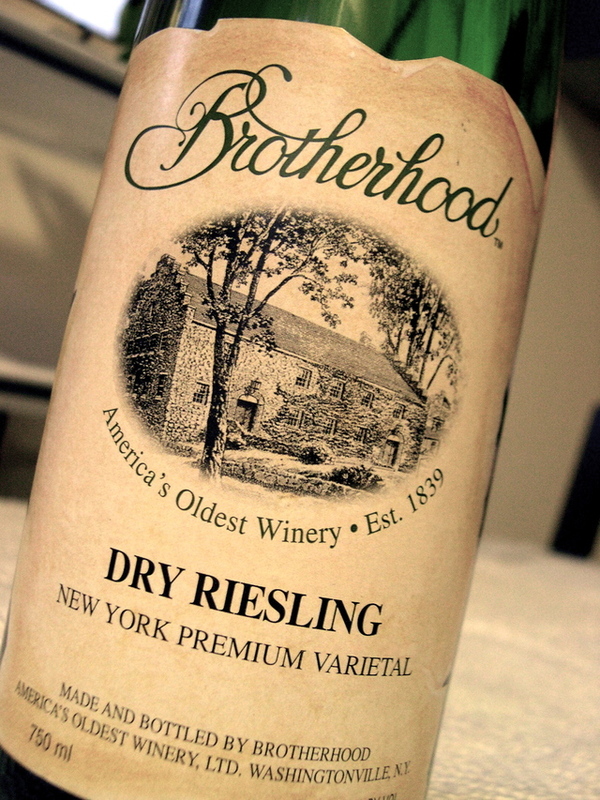 I drink riesling all the time and love its food-friendliness and relatively affordable quality. You can get top-flight riesling for a fraction of the cost of similar quality Bordeaux, California Cab, etc. Well I was definitely disappointed. Tongue: Light body and tart to the point of being a little sour on the finish. Lacks fruit, with only a little under-ripe apple/pear and sour lemon. Light acid. Reminds me of a cheap pinot grigio in some ways.